I posted this on the 12th, describing my confusion about Phoebe on twitter. 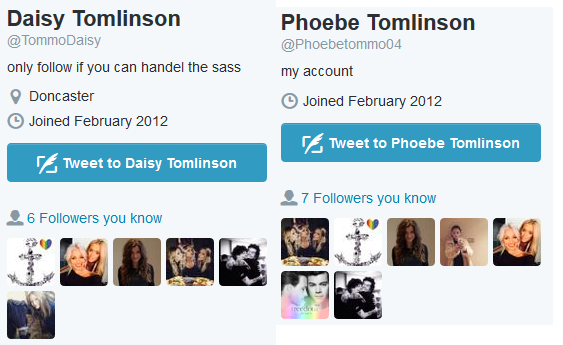 Phoebe and Daisies accounts are real. Read this post and this post if you are still in doubt (it also includes some relevant info on zayns sisters tweeting). 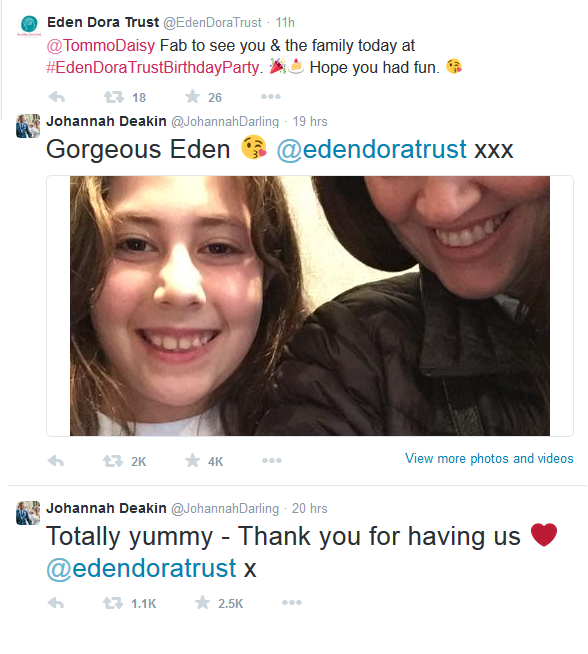 These pics show that both accounts have been active since february 2012. 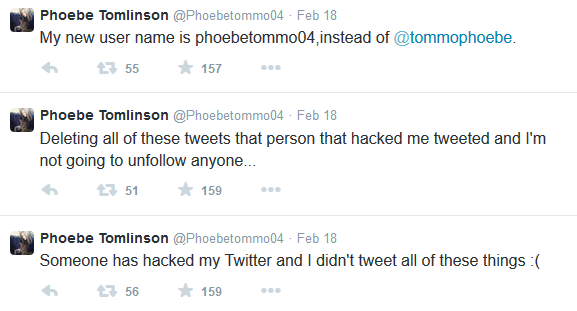 Now going back to the 12th, where Phoebe supposedly got "hacked" and her account got deleted, it gets even weirder: Phoebe said she got hacked and would delete all the tweets from the hacker as soon as she reactivated the user.She also changed her username. It was then reactivated again a few days later, stating that the account had been hacked and that she was going to delete all the hackers tweets, which included everything that had anything to do with Harry and Larry. It was literally just a picture of harry at Annes place. Nothing special, but asides from directly tweeting the supposed Phoebe, Anne also tweeted about people "sharing private photos" again and seemed upset. So Phoebe was supposedly hacked. Anne obviously was upset about the account claiming to have received photos from her. 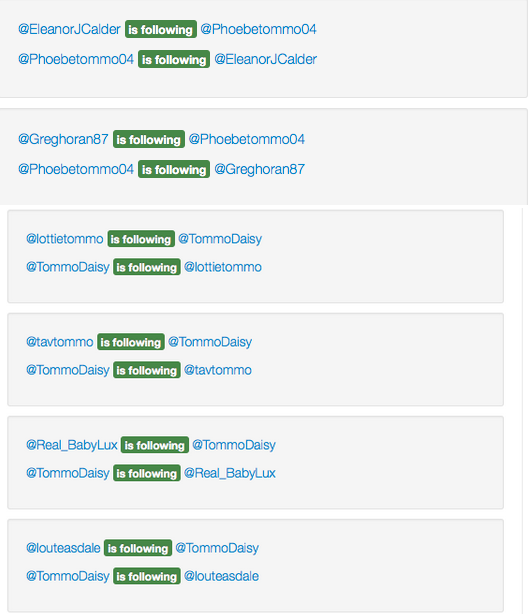 The deleted tweets were all related to Harry or Larry, but they didn't confirm anything. In fact, one of the deleted "hacker"-tweets denied Larry. Since Phoebe and Daisy have been active after the hacking, they've both supported Larry and larries, yet no one is claiming they're hacked currently. So in conclusion, the hacker, or whoever it was, was denying Larry. 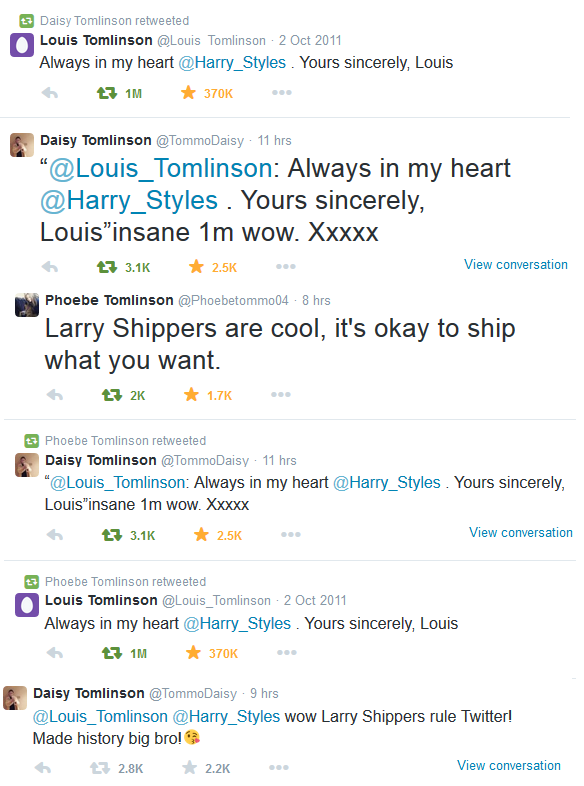 The current phoebe and daisy on twitter are supportive of Larry and Larries. I'm not even sure i understand what i just explained. I don't know whether the hack was real or not, but i can't see a very good reason of why they would lie about it, since the only thing that happened during the alleged hack was the person on the account denying larry and maybe leaking a few pictures that wasn''t at all relevant or incriminating. Unless you consider the pure fact that Phoebe claimed she got the Harry-photo from Anne a Larry-proof, then i don't see why they would have a hidden agenda to pretend that there was a hack; - Especially considering how openly supportive both Daisy and Phoebe have been sine they returned to twitter with NO ONE claiming they're hacked at this very moment. However i don't see the point in hacking Phoebe's account only to leak a few meaningless photos either. The hacker denied Larry, but also tweeted about respect. It just doesn't seem like a typical elounor-shipper-hack, where Larry would just be rudely denied and the larries would be blamed. In conclusion: this was either a weird hack by a hacker with no agenda, or it was a fake hack which was made up to cover up.....??? Annes relationship with phoebe? Phoebes relationship with Harry? None of the two options makes sense to me.It just all seems very, very weird. It is also worth to mention that Phoebe posted a Elounor picture from Jay's wedding after she reactivated. Anne tweeted again about people leaking photos. I don't know whether the original source of the photo was actually Phoebe or whether Anne was referring to phoebes account (which would be weird, because, ya know, the photos didn't include any of her family members this time), but it's weird in any case, since Phoebe currently seems to be supportive of both L&H and El. The entire hack-thing could also just be Anne not knowing that Phoebe had a twitter and forgot she sent her a photo.... But that seems extremely weird and even less likely than any of the other possibilities. It just wouldn't make sense, because why Phoebe claim she was hacked if the only thing that went wrong was Anne not knowing that Phoebe had a twitter account? Why is litterally everything having to do with his band so damn shady?